This Sunday, I will march down Michigan Ave. in support of National Puppy Mill Awareness Day, September 27th. It will be my first march, but my fight started 7 years ago when I walked into my first Amish barn and saw lifeless dogs bought and sold like junk. Seven years ago, I estimate that 1 in 100 people knew what I meant when I said the words “puppy mill.” Today, I estimate that to be 1 in 25. The message, long in the making, is quickly becoming louder. We are being heard. 84 cities across the nation have bans on the retail sale of puppies unless they come from rescues and shelters. More cities and counties are in the process of adopting similar ordinances. The message is strong and it is simple, but it is not without contention. For years, those of us fighting for mill dogs were ridiculed, often ostracized for caring more about dogs than kids. We overcame such initial scrutiny and as our fight has grown momentum and tripled in strength, we are being met with anger, often pure rage. Recently, we have been called controversial, as if exposing the horrific reality of mill dogs is questionable. The people we are fighting are running out of options. They have gotten mean and nasty. That is what we ALL need to do on September 27th National Puppy Mill Awareness Day. We will walk together – unified in our mission and strong in numbers. 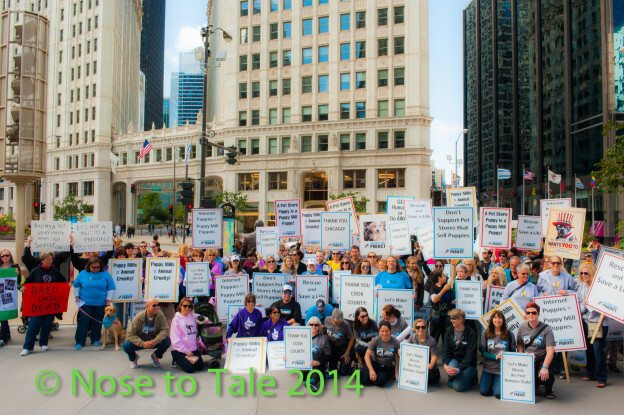 We will march and show we are here to educate, to bring awareness, and to fight for the dogs who have no voice. Fierce opposition based on greed and cruelty is opposition we are more than willing to take on… For the love of dogs of everywhere, for the freedom of mill dogs locked away in dark barns and for the future of canine companionship, we will walk and we will be heard. What we speak will soon be the self-evident accepted truth. This entry was posted in Uncategorized and tagged Chicago, dogs, march, puppy-mills, the puppy mill project on September 21, 2015 by sheltertails5839.